The Assistant Construction Superintendent supports the Superintendent in the building process to assure that homes are built to company specifications, punch-lists are completed within a prescribed time period, maintain a clean, organized and safe job site, and pick-up any needed material. Interact professionally with customers, trade partners, suppliers, inner company personnel, land developers, and other associates of Company. Perform any necessary tasks for Superintendent in order to maintain neat, organized and safe work environment. Execute the completion of any customer orientation list delegated by the Superintendent. Perform all necessary punch-out required by the superintendent in order to complete any specific sequence of construction. Support Superintendent in maintaining clean, neat and organized construction site. Notify and obtain for the Superintendent any materials required to complete a project, punch-list or customer list delegated by the Superintendent. Demonstrate a technical proficiency in carpentry, paint and drywall finishing, concrete repairs, grading and landscaping in order to facilitate required adjustments or repairs. Possess adequate tools required to facilitate the above-referenced repairs. Demonstrate the ability to manage tight deadlines, promptly address changes without disrupting schedules, and managing high volumes of work with minimal direct supervision. Demonstrate an awareness of job status, construction schedules, quality inspection, pre-settlement, pre-closing and follow-up orientations. Maintain a clean, safe and organized work environment on a daily basis. Please submit resume to info@iveygroup.com. No Phone Calls, Please. Do you value Teamwork, Quality, Integrity, Professionalism, and Accountability? 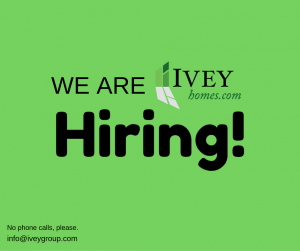 Ivey Homes is hiring! We currently have two opportunities available, job descriptions are below. To apply, please forward a cover letter and resume to info@iveygroup.com. No phone calls, please. Ivey Homes is growing rapidly and we are seeking to hire high potential sales professionals that are interested in taking their career to the next level. The ideal candidate is a self-starter and self-motivated, goal oriented and a team player. Administers all sales contracts, change orders, coordinates and administers all closings. The applicant is responsible for generating and maintaining certain sales pricing and marketing materials for internal and external use, generating house files and facilitating the accurate and timely completion of all documentation required for contract ratification and house start. The applicant must also provide general office support for the Office Manager, Owner(s), and Sales & Marketing Director. Comfortable with and working knowledge of all Microsoft software a most. To apply for either opportunity, please forward a cover letter and resume to info@iveygroup.com. No phone calls, please.